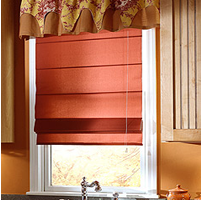 Melhanna Roman Shades combine the elegance of drapery fabric with the convenience and function of a window shade. This popular window shade comes in two styles: Classic Flat; or, Teardrop for added depth and dimension. This style of window shades is mounted beneath a headrail lift system that provides a clean appearance while maintaining privacy & control of incoming light. Because the fabric flows over the face of the headrail there is no need for an additional vallance. Skandia’s Treanna Sheer window shades are light and airy, featuring soft fabric “vanes” that are layered between two elegant sheers shades. 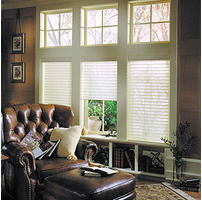 Treanna window shades features a unique light diffusing or room darkening vane coupled with a double layer of sheer fabric. Treanna window shades offer five modes of operational views – in light filtering and room darkening fabrics – giving you the ultimate in control over privacy, view and the amount of light you allow into your home. Alanna Z-pleated shades are simple yet elegant and can be custom constructed in fabric from ultra sheer to extremely opaque. Alanna Z window treatments by Skandia also “stack” compactly & almost completely when raised – to maximize your window’s view area. Available in an almost unlimited selection of colors, the head & bottom rails are color coordinated. 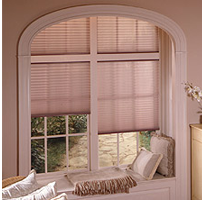 Affordable Alanna Pleated shades are an excellent alternative to cellular shades for any budget! Our talented designers will be happy to schedule an appointment in your home and show you a wide selection of window treatments – including Skandia shades – exclusively in the following areas: Agoura Hills, Bell Canyon, Calabasas, Westlake Village, Hidden Hills, Thousand Oaks, Camarillo, Malibu, Ventura, Topanga, Chatsworth, West Hills, Pacific Palisades, Oak Park, Somis, Montecito, Carpinteria, Santa Barbara, Newbury Park, Moorpark, Simi Valley, Northridge and Port Hueneme. Call: 818-597-0440.